Johnny & The Self-Abusers. The band was short-lived and only released one single before half of its members formed The Cuban Heels and the other half formed Simple Minds. The band took its name from lyrics in the David Bowie song Jean Genie. Initially, the band released three albums that took on many different musical styles, from dense artsy pop, to darker experimental rock, and finally Euro-disco. By 1981 the band began to transition into a more accessible rock sound that led them into a U.K. movement known as New Romanticism. This particular style didn’t quite fit into the New Wave sensation, but did have similar qualities such as a synthpop sound, and flamboyant fashion and personalities. A few of the New Romantics included Duran Duran, Culture Club, Adam Ant, Ultravox, Spandau Ballet, and of course Simple Minds. Over the years the band has had continuous turnover, however the two constant original members are singer Jim Kerr and guitarist Charlie Burchill. The band has released sixteen studio albums over a 35 year career with another due for release in late 2013. In 2011 Simple Minds embarked upon a world wide Greatest Hits tour. After two years the tour will briefly make a seven city appearance in North America. 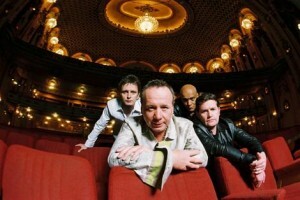 Frontman Jim Kerr has pleaded with U.S. fans that these shows must be well attended if you ever want us to come back. I booked my ticket today for the Los Angeles show on October 15, so there. 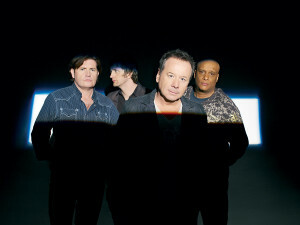 Visit the Simple Minds website.